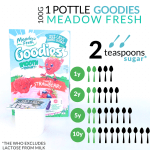 Hi this is great but any chance you could include the other kids yoghurt as well? So many more on the market! So helpful to be able to compare them together. I am adding more, the gallery is growing over time. But I just wanted to explain how I was working it out etc. but yes I agree it would be great to have more of them done. Are there any in particular you are interested in? What an incredibly well balanced article. Thank-you for not being another “sugar is all bad and fat is even worse” warrior!! Fabulous to read some common sense laid out in plain English. Thank-you! Thank you. I’m glad I’m coming across that way, as that’s how I want to come across! I am not a sugar Nazi but I do think a little bit of extra knowledge is useful for everyone as too much sugar is sneaking into our diets. 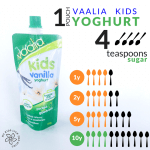 I wonder where these extra sugars come from in the second yogurt – it does not contain extra sugar in ingredients list. 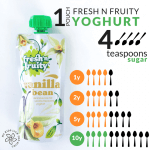 May be from fruit puree? 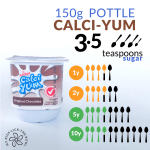 But this yogurt contains three time more puree than the first one. Is it bad? not sure. 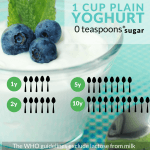 You infographic is really good it catches the eye but at the same moment people who see it may come to wrong conclusion – that one yogurt is better than others ONLY because it contains less sugar on the label. It is interesting. The one I have in my graphic is the honey collective one as I haven’t done them all. And I am definitely not out to vilify any products. When I read the second label. The fruit is fruit purée concentrate.. as it is a concentrate the WHO would classify this as added sugar, same as it would the pineapple juice concentrate. So the collective one because it had more fruit purée concentrate 7% compared to the 1.9% in the uno it has more added sugar, plus it then has the pineapple juice concentrate too. 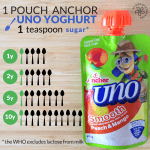 Where there is only the one sugar source in uno being the 1.9% fruit purée. Absolutely! It’s one of the tips I give parents all the time!